You’ve reached my personal site which was designed and coded by me, Hollyn Harter. I'm a freelance graphic designer / web designer living and working in the Antelope Valley California area, servicing Palmdale, Lancaster, Santa Clarita and the surrounding cities. I am experienced on both Mac and PC platforms and specialize in creating appealing websites and e-newsletters (which comply with the latest web standards), innovative logos, beautifully designed brochures, and much more! Being a graphic designer is perfect for me because I can express myself, touch people’s lives and have fun all at the same time. Feel free to click around and check out my work! 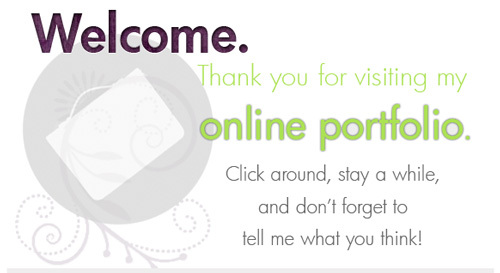 Here’s a little peek of what you’ll see in my online portfolio. Enjoy! I had the pleasure to design not only the invitations, but also the identity of this winter wedding which included place cards, table numbers, favors, programs, etc. This is a place for me to talk about the graphic design industry, my ideas, cool designs, and whatever I feel like sharing with the world. I try to update it every week, so check back often! Click here to visit my personal blog. Hey, want to learn a little bit more about the talented designer behind this awesome site? Home | Logos | Advertising | Posters | Brochures / Promo | Internet Design | Packaging | Misc. make this website the best it could possibly be!